Probably not. It's been several degrees above zero today. How about in the Netherlands? No, overhere we won't be having a white Christmas either. White Christmases are as rare overhere as polar bears in a rainforest. Fortunatly we in Stormark always have white Christmases. * Orders Raido Strategic Bombers of the Naval Air Service to drop artificial snow. I'm at my parents' now but I forgot to bring the maps with me. So they'll be published as soon as I get home. He is already home, I think. Very true, but not for long! I will go to England on Tuesday! Maps will be uploaded tomorrow. Just doing some finishing touches to them. Are you going to visit Cornwall? Indeed The Land of the Celts. The map looks great, Sir Cashmaiel! 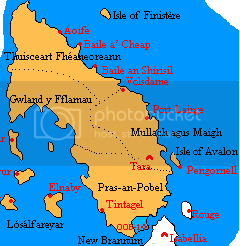 Why are there no cities in the province of Gwland y Fflamau?